An estimate of 80% of people around the age of 11 to 30 experience acne at some time in their life. As per American Academy of Dermatology, acne is caused by over active oil glands. When excess oil combines with dead skin cells and clogs the pores, bacteria multiplies in it causing acne lesions. Honey, lemon, apple cider vinegar and aloe vera are some good choices. Quick Note: Do you know honey is one of the ingredients of many anti-acne products because of its acne benefiting properties? 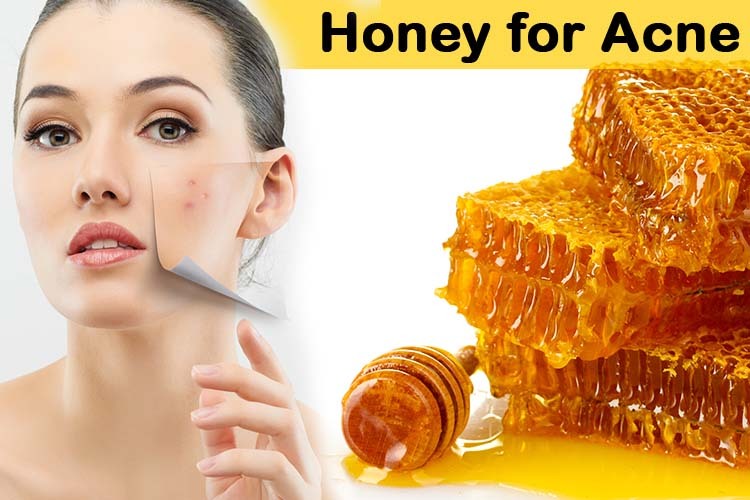 Read on to know the amazing benefits of honey for curing acne with scientific proofs. Here are the amazing benefits of honey for curing acne with science backed proofs. 1. Antibacterial – Honey contains antibacterial properties. As per a study, honey manipulates the follicular microenvironment to control the P.acne bacteria. Propionibacterium is responsible for the bacterial action in the clogged pores leading to inflammation. 2. Anti-Inflammatory – Honey contains anti-inflammatory properties which reduce the swelling and redness associated with acne. As per a study, the results confirmed that honey has anti-inflammatory effect even in chronic inflammatory conditions. 3. Has Osmotic Effect – Honey has an osmotic effect; it absorbs water in the wound and releases hydrogen peroxide, a great antiseptic which kills bacteria and clears acne. 4. Acts as Antioxidant – Researchers state that honey contains polyphenols which are powerful antioxidants that reduce and prevent the damage caused by free radicals. 5. Controls Sebum – Honey locks moisture in skin cells leaving them hydrated and supple. Dehydrated skin is one of the main reasons for excess sebum production. For internal consumption… Add 1 tablespoon of honey and 2 teaspoons of lemon juice into a glass of warm water. Stir well and drink it. This mixture also helps to detoxify the body and boost your metabolism. Nutmeg contains antimicrobial, anti-inflammatory and antioxidant properties which are helpful to treat acne discomforts like swelling and redness. Strawberry contains natural salicylic acid which is very effective in treating acne. The acidic nature of strawberries remove the excess oil from the skin. The cinnamaldehyde present in cinnamon contains anti-inflammatory and antimicrobial properties which reduce the swelling and treat acne. The saponins present in oatmeal contains cleansing properties which remove the impurities, oil and dead skin cells that clog the pores. It is also offers moisturizing, anti-oxidative and anti-inflammatory properties. Turmeric is an anti-inflammatory and disinfectant which kills bacteria and soothes pain and redness. Various studies have also confirmed that it removes excess sebum and regulates its production. Aspirin dries out the pimples, unclogs the pores and shrinks the open pores. It contains salicylic acid which cleanses pores and kills the bacteria causing acne. The gritty nature of sea salt exfoliates the impurities and dead skin cells. The mild alkaline nature help to reduce the oil production in the skin. Coconut oil brings balance in the oil production of the skin. Apart from that, it fights with acne causing bacteria and moisturizes the skin without clogging the pores. The antimicrobial and anti-inflammatory properties of tea tree oil kills the bacteria causing acne. It also speeds up the healing process. The allicin present in garlic contains antibacterial properties which kills the bacteria causing pimples. The antioxidant properties of garlic prevent the damage caused by free radicals. The antioxidants, tocopherols, carotenoids and ascorbic acid present in green tea prevent the excess oil production and hydrate your skin. The acidic nature of lemon removes the dead skin cells, controls the oil production and unclogs the pores. The vitamin C present in it promotes healing process. It also contains anti-oxidant and antibacterial properties which helps in treating acne. The mild acidic properties of apple cider vinegar balances the skin’s pH levels which helps to regulate oil production. The astringent properties of apple cider vinegar shrinks the open pores. It also contains antibacterial properties which helps to kill the acne causing bacteria. The antibacterial properties of tomato kill the bacteria causing acne. It also contains antioxidants which heal the skin damage. The anti-inflammatory and antibacterial properties of neem help to treat acne effectively. Being a natural astringent, it helps to fade the acne scars and keep the skin smooth. The anti-inflammatory and antioxidant properties of red sandalwood powder reduces the inflammation and redness. This combination is effective in treating mild – moderate acne. Aloe vera contains healing and antimicrobial properties which help to treat acne. It also soothes the inflammation and reduces the redness. Manuka honey is prepared by bees which gather it from only Manuka trees. It is considered as a non-peroxide because its enzymes will not generate hydrogen peroxide when applied to the skin. However, it is rich in antibacterial properties. This significant effects are contributed by low pH and high sugar levels. Do you know that there are almost 300 types of honey available in the market? Surprising isn’t it! Some of the popular one are buckwheat, Manuka, neem and Acacia. The composition of honey depends on the environmental condition in which they harvest. Be it either for topical application or internal consumption, we recommend to try the raw darker varieties. The darker and denser versions of honey contains more amount of nutrients and enzymes than the lighter and processed ones. Processing strips off the essential nutrients and beneficial properties of honey.